You might recall that photo, provided by police on Monday when they announced the Sunday arrest of a man at a house on Puget Ridge. As we noted in an update to the story, he was released from jail Monday night on personal recognizance. Now, he’s back in jail, and he’s been charged: One felony drug charge is filed against 28-year-old Gregory Lee Thompson. The charging papers say police found “evidence of drug-dealing activity” at Thompson’s house – baggies and scales, along with the 400+ pills and meth listed in the police report. And the documents say prosecutors believe the 19 guns that also were found – though they are not the subject of a specific charge at this point – “increase the risk that the defendant will commit an act of violence as part of his drug dealing activity.” A $20,000 arrest warrant was issued when the charge was filed, and that’s why Thompson is back in jail as of this afternoon, just before he was due in court for a trial-readiness hearing in another drug case. That hearing has been rescheduled for next Friday. 13 Replies to "CRIME WATCH FOLLOWUP: Puget Ridge raid subject charged, back in jail"
It’s certainly not illegal to own weapons but I sincerely hope his were found in a safe. Having that many just laying around and available for the common prowler is not a wise move for society and it seems his “clients” would up that risk. The photo somewhat implies they were found between the mattress and box spring which shows we are possibly dealing with extreme intelligence here, let alone a dope fiend. The photo was provided by police with no elaboration on its circumstances, or whether it was even taken at the search location or somewhere else. Maybe your right! Back at the Precinct they have this old mattress just laying around they use for photo shoots. Really? Just saying we don’t *know*. Show-and-tells aren’t always fancy like this one. They’re also pretty rare. I don’t think meth users/dealers are super concerned about safety issues from unsecured weapons. I’m sure they were strewn all over the place in a chaotic fashion. I really hope this guy gets locked up for a while. The mattress and box springs provide blank (and mostly neutral-colored) backgrounds which make for better photographs. Try photographing random objects in a cluttered room. You’ll see what I mean. The photo doesn’t imply anything; it was set up in a manner that makes the subjects of the photo (the contraband) most clear. Officers served a search warrant in West Seattle Sunday morning (and) found hundreds of pills and 19 guns. Southwest Precinct Anti-Crime Team Officers converged on a home in the 7000 block of 18th Avenue SW Sunday at 10 a.m. and arrested a 28-year-old man as he attempted to flee through the back door of the house. 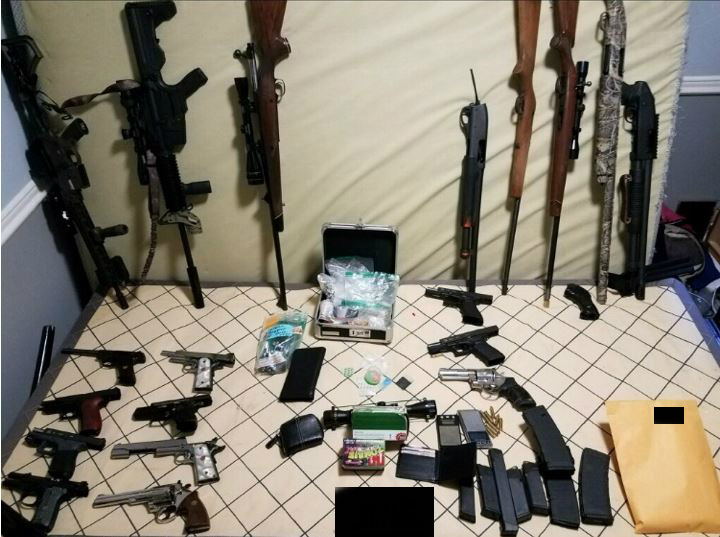 Officers searched the home and found 189 hydrocodone pills, 276 amphetamine pills, 3.5 grams of methamphetamine, 11 handguns, five rifles – one of which was modified with a bump stock – and three shotguns. Officers placed all of the weapons into evidence pending further investigation. “Found” them it says, found where is the unknown so a hopeful safe is not out of the equation. I realize we’re dealing with a lowlife thieving dope fiend here but who says he was always home to protect both his product and firearm collection from others, especially when you run in those circles. Sure am glad those guns, drugs, and this dealer are off the streets!! Anybody know what the Seattle police policy is on confiscated weapons? I’m hoping it is that they are destroyed. Lately some have been sold at auction and then unfortunately used against the Police at a later date. If they were legally owned and not used in a crime then they are held for you until you get out, but as a felon you can’t own one but we all know that doesn’t work. Must be an avid hunter. . . . .